The Big Share Raises a Record $315,000…and Counting! Community Shares of Wisconsin (CSW) is pleased to announced The 2017 Big Share™ raised a record-breaking $315,000 from 2,700 unique donors, who generously gave to support local social justice and environmental nonprofits in Wisconsin. 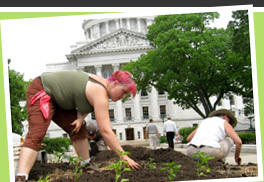 The Big Share, which took place on March 7, is an annual day of online giving to benefit nonprofit members of Community Shares of Wisconsin—groups that are on the forefront of the social and environmental justice movement in Wisconsin. Now in its third year, the 2017 Big Share broke its previous giving record by over 15%. Those sponsors include Madison Community Foundation (MCF), which serves as Partnering Sponsor for The Big Share as it has since the event began. In addition to funds, MCF provides visibility and leadership to the event. A key reason for The Big Share’s success is the training provided to participating nonprofits and one-on-one support offered by CSW staff and interns in the areas of digital communication, marketing, and fundraising. Big Share training support and the CSW internship program are made possible thanks to Madison Gas and Electric, which serves as Digital Communications Sponsor and also provided digital communication training to CSW members. One nonprofit that benefited from the training offered by CSW was the Bayview Foundation, which received a special prize for achieving the most growth on its Big Share campaign compared to 2016. Bayview’s fundraising increased over 1,000% from 2016 to 2017. Further training support is made possible through a generous grant from the Evjue Foundation, which continues CSW’s longstanding partnership with the UW-School of Journalism and Mass Communications, the Zendesk Neighbor Foundation, and a generous new partnership with American Family Insurance. Thanks to the support of additional community partners, CSW was also able to offer more prizes to its members, which increased donations and engagement. Groups winning grand prizes for raising the most funds, or having the most unique donors include Clean Wisconsin, GSAFE, and End Domestic Abuse Wisconsin. The list of business partners that offered incentive prizes, helped with prize deliveries, or hosted special events throughout the day include Home Savings Bank, MG&E, Sprinkman Real Estate, Madison Community Foundation, National Guardian Life Insurance, Zendesk, Forward Community Investments, Heartland Credit Union , Great Midwest Bank, Wegner CPAs, Alliant Energy, Fire Fighters Local 311, Budget Bicycle Center of Madison, Union Cab of Madison Cooperative, Mad Rollin’ Dolls, Just Coffee Cooperative, Plan B, Yelp, Cargo Coffee East, Java Cat, Sardine, and others. Further support is offered by the Isthmus, 105.5 Triple M Radio, and WKOW 27 TV, who serve as media partners for the event. To find out more about The Big Share, visit www.thebigshare.org. To view photos more photos from the 2017 Big Share, visit the Community Shares of Wisconsin Facebook Page. Update: As of Monday, March 13, The Big Share has now raised over $320,000 from nearly 2,800 donors. That’s an additional $5,000 that has come in since the end of The Big Share on March 8. Thank you to all of the donors who have been inspired to give after the event! For over 45 years, Community Shares of Wisconsin’s members have advanced the causes of social justice and environmental protection in Wisconsin, and as the oldest social justice fund in the country, CSW fuels their efforts through fundraising, training, and collaboration. CSW raises money through workplace giving campaigns, the Community CHIP® program at Willy Street Co-op, the Round Up program at Capitol Centre Market, and The Big Share. Community Shares not only raises money for its groups, it actively helps expand their capacity through training, 1:1 support from experts, networking, and technical assistance. For more information, visit www.communityshares.com.